The BYOD (bring your own device) phenomenon may be newer to healthcare, but it’s not a fad. It is here to stay and it is continuing its proliferation into the healthcare sector. There are tons of really useful apps available to healthcare professionals to help make them more efficient and informed than ever before. So doctors and even nurses are expecting to use these devices to take advantage of all the benefits they have to offer. The demand for BYOD on hospital wireless networks is growing and will continue its steady pace. Aruba Networks conducted a survey that shows hospitals are embracing BYOD initiatives. Here are some interesting results from the study. Just 8 percent said their hospitals currently enable full access to their hospital network for user-owned devices. The demand for BYOD is continuously becoming a pressing issue for healthcare information technology professionals. With benefits like reducing costs, increased productivity, and improved relationships with patients, BYOD integration just makes sense. It is easy to see why healthcare organization might be hesitant on incorporating a BYOD policy. Certain BYOD strategies present particular security risks: the introduction of mobile malware onto a hospital network, data breach, etc. 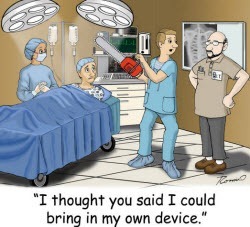 That is why it is extremely important for hospitals to carefully and properly plan every aspect of their BYOD solution. If you do not have the tools you need to implement the proper BYOD policy in your organization, seek the expertise of proven technology consultants to ensure you are taking every necessary security precaution and getting the maximum benefits of BYOD. If your hospital is ready to integrate a successful and secure BYOD solution, we are here to help. Here at SecurEdge, we are experts in hospital wireless networks and we always plan for the future of wireless. The team here at SecurEdge Networks is made up of professionals who have helped many clients through their BYOD challenges and can help you with yours. We have worked with many hospitals throughout the United States. If you have any questions or would like a free consultation you can contact us here. Good luck!